1. 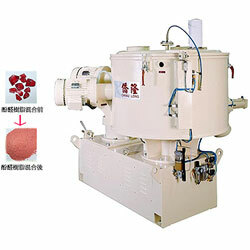 This machine can be used for mixing dye, chemical raw materials, Ferrite, cement with sand and dye. It can be used for diffusing fiber glass and mixing the material(s) of brake. 2. The machine can be mixed much kind material, Especially, which installed the high speed motor & diffusion tool and those can mixed material more evenly in short time, no residual heat and no to damaged the original quality of mixed material moreover. 3. The machine can be diffusioned the body material more quickly. 1. Tank capacity: 200 L.
2. Feeding capacity: 70-140 L.
3. Mixing weight: 80 kg. 4. Main power: 10 HP 4 P.
5. Auxiliary power: 10 HP x 1. 6. Machine size: 1700 x 900 x 1500 mm. 7. Machine weight: 1000 kg.